We clean hundreds of items of vintage clothing each month, and with this much laundry, we have learned a great deal about stain removal and the particulars of collectible clothing care. Water damaged clothing is an especially frustrating stain, because the stain's components are concentrated along the edge of the water itself, leaving a ring that is hard to remove. 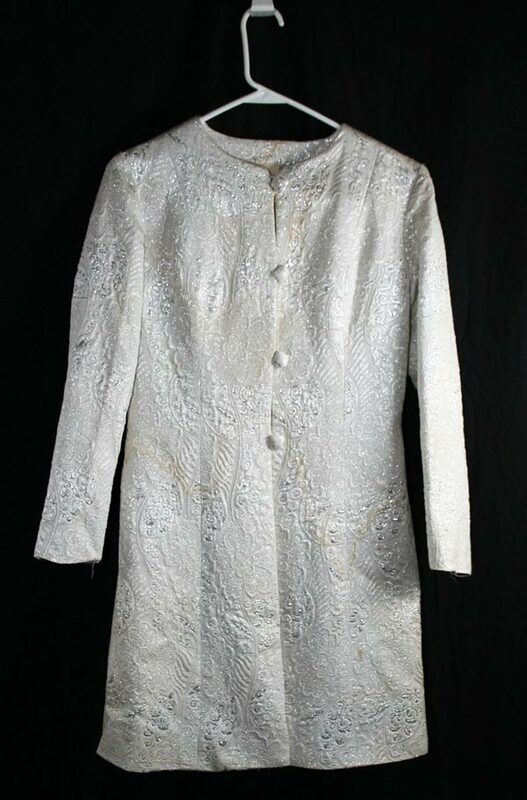 A friend recently brought over this silvery white 1960s brocade jacket that had a beautiful look to it, but was unfortunately water damaged. Can it be fixed? The first technique we try with water damage like this is a long soak in OxiClean. If the garment cannot handle OxiClean, a whitener like borax or washing soda can be helpful, or just a strong detergent. After several hours soaking we would assess the stains, and if they had lessened we would repeat the soak. If they had not lessened at all, we would try a different solvent, perhaps a color-safe bleach or hydrogen peroxide. With water damaged clothing, we normally find these soaks have to be repeated at least 2-3 times, and if the garment can handle a direct application of detergent or another solvent, we will also apply it directly to the stain to sit for a few hours. 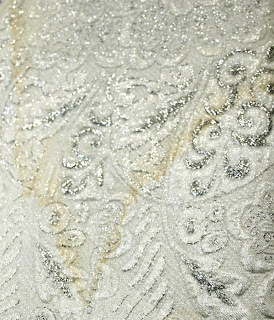 Once the stain has lifted, a normal wash or dry cleaning is in order. In the case of this jacket, it had some fray beginning at the edges that were most often used (along the buttons and their closing loops). A vintage clothing professional would protect these with nylon mesh before cleaning to avoid further fray. In this case, however, we discussed the possibility of replacing the buttons, and perhaps the loops as well, because the fraying had become rather noticeable. This particular jacket is capable of withstanding a hand wash and soak, even though it is a brocade. But for garments you are afraid to clean yourself, or dry clean only items, leave it to a professional. This warrants a warning - be aware that if you take a garment to a dry cleaner, they will finish its cleaning with a steam or pressing. This heat can actually set the stains in place (if the cleaner was unable to remove them). A considerate cleaner will omit this step if you ask, but be prepared to receive a wrinkled garment. 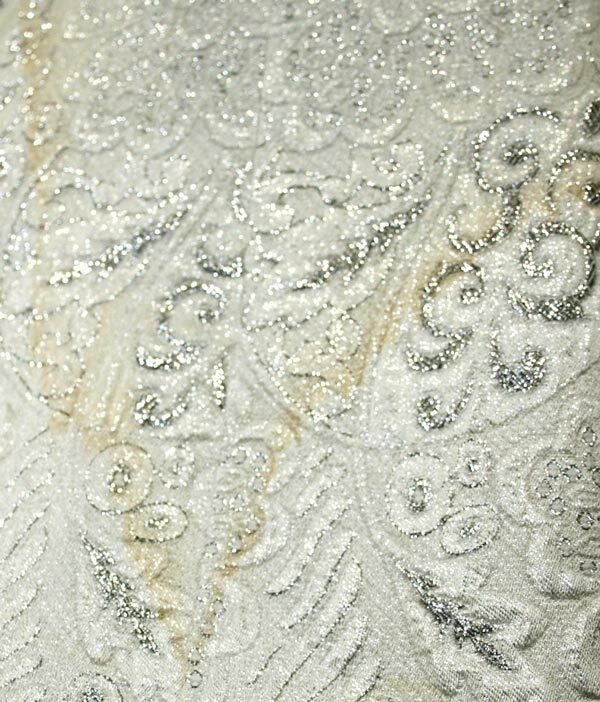 We only ask for this if we plan to work on the item further, in case the stains remain after the dry cleaning is complete. Unfortunately water damaged clothing is relatively common here in southwest Florida. We visit lots of homes undergoing a clean-out, and because Florida closets are humid, they are a notorious breeding ground for mildew. It's important to monitor your storage spaces to avoid this kind of slow but serious damage. In garages, the humidity is coupled with the potential for flooding. A malfunctioning water heater or a broken washing machine can spread an inch or more of water across a garage floor in just minutes. The same issue is true for basements. If you store clothing or other valuables in your garage or basement, use wooden pallets as a protective layer below boxed items. Keep clothing protected with plastic (not air-tight but as a cover) if you store items where plumbing is located above. The key to minimizing the injury caused by water or flooding is to get rid of the water as quickly as doable. The quicker water is removed, the less probably mold growth can occur. Mold growth will occur simply twenty four hours when the realm is affected. The affected area ought to be ventilated and dried right away. Use high rate fans, air movers, and dehumidifiers to urge the area as dry as doable.Be sure to examine for condition often. Buildup, shape, and decay can hurt your property and influence your wellbeing. Depending on the flood damage Miami experts keeps such issues from happening. The specialists can help avoid further harm with our complete cleanup and rebuilding administrations. They will pump out the water, dehumidify the structure and your property, uproot any smells, and guarantee that your property is totally restored from water harm.